John Dorney looks at one of the most heated debates in modern Irish history. In April of 1922, during the period of truce between the end of the War of Independence and the start of the Civil War, over a three day period (April 26-28), 18 people died violently in West Cork. Four of them were British soldiers, three intelligence officers and their driver, abducted and killed by the IRA in Macroom. Another was an IRA commandant, Michael O’Neill, shot dead by a local loyalist named Herbert Wood, as he was breaking into the house of the Hornibrooke family to seize their car. Woods and the two Hornibrooke men were subsequently seized by the IRA and never seen again, we must presume killed. The killing of Michael O’Neill seems to have sparked a welter of shootings. Over the following two nights ten more civilians were shot dead in towns and villages around Dunmanway inWest Cork. Parties of armed men made night time raids on houses in the Dunmanway, Ballineen and Murragh area, called out their targets by name and shot them dead. All the victims were Protestant males, many were believed to have been loyalists and informants to the British forces. Two of the dead were sixteen year olds, one was over 60. The perpetrators were not identified but it seems likely they were IRA personnel. At the time, the episode was assumed to have been a sectarian massacre and was condemned by all sides. It was a period of intense sectarian tension in the north. Just a month before, uniformed police in Belfast, in two separate incidents, had broken into homes and killed twelve Catholic civilians in retaliation for attacks on the police. The events in and around Dunmanway were seen against this background and presumed to have been retaliation against southern Protestants. Events, such as the terrible murders at Dunmanway …, require the exercise of the utmost strength and authority of Dáil Éireann. Dáil Éireann, so far as its powers extend, will uphold, to the fullest extent, the protection of life and property of all classes and sections of the community. It does not know and cannot know, as a National Government, any distinction of class or creed. In its name, I express the horror of the Irish nation at the Dunmanway murders. Eamon de Valera, leader of the Anti-Treaty republicans’ political wing, condemned the killings two days later at Mullingar. The fact that they were all Protestants suggested that these crimes were a reprisal either for the murder of O’Neill or for the murder of Catholics in the north…These murders, violently in conflict with the traditions and principles of the Republican Army, caused shame and anger throughout Ireland”. IRA leaders in Cork put guards on Protestant houses to prevent a repeat of the killings, Tom Hales, Brigade commander issued a notice, “to give all citizens in this area, irrespective of creed or class, every protection within my power”. But no one was ever made to answer for the killings. In this respect it was in fact typical of the many incidents of politically motivated killings that occurred around Ireland from 1919 to 1923. No one was ever held to account for Bloody Sunday on 1920 (on either side), nor for the McMahon murders of March 1922, nor for the Ballyseedy Massacre of March 1923 (in the civil war) either. The killings in West Cork were unusual in the number of civilians that were killed and in the fact that they were all Protestants. However, in the context of a country that was sliding towards nationalist-on-nationalist civil war, they were quickly forgotten, except perhaps in the locality. Many years later, in 1998, a Canadian historian of the Irish revolution, Peter Hart, published a book based on his PHD thesis, The IRA and its Enemies. One chapter of the book, ‘Taking it out on the Protestants’, was centred around the killings of April 1922, which, it argued showed that at the centre of the republican revolution was, “ethnic intolerance”… “the final reckoning of an ancient conflict between settler and native”. Hart wrote that while, “the belief in the existence of the loyalist plot was real”… “no such conspiracy existed”. “In the end…the fact of the victim’s religion in inescapable. These men were shot because they were Protestants”. Hart’s argument appealed strongly to unionists, who used it to argue that the republican movement from its inception had been essentially sectarian and also to many elements of southern Irish society which wished to discredit the idea that republican violence was, or had ever been, a legitimate means of political struggle. It also however provoked a storm of angry responses. The idea that the IRA of 1919-23 had been motivated by sectarianism and that it had carried out pogroms against defenceless enemies based on their religion was intolerable, basically to two groups. 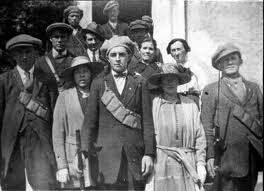 One was traditionalist nationalists such as Meda Ryan, for whom the Old IRA were heroes not be questioned. Ryan produced an angry riposte in her revised book on Tom Barry, Tom Barry IRA Freedom Fighter, in which she claimed that all of those killed had been informers and had been named on a list of ‘helpful citizens’ by the Auxiliaries, which some IRA men (but not she herself) had seen. In a similar vein, Brian Murphy produced a British intelligence document which showed that Hart had omitted to include a comment that the area around Bandon was the one part of the south where large numbers of Protestants had been helping supply information to the British forces. The other group to whom Hart’s work was anathema was those who saw in it an agenda to delegitimize Irish republicanism by framing it as a sectarian or “ethnic” movement – the exact mirror image of its loyalist counterpart. Partition of Ireland was therefore a logical outcome and attempts to end it objectively sectarian. This was intensified by the fact that some media commentators, notably Kevin Myers and Eoghan Harris – used Hart’s work to show precisely this. Within the context of the Northern Ireland peace process and growing political prominence of Sinn Fein on either side of the border, the campaign to discredit Hart’s work was also an attempt to rehabilitate the legitimacy of republican history as non-sectarian and popular. To these groups, the legitimacy of the IRA as the army of the Irish people in 1922 was taken for granted. Once it could be shown that those killed were, or were suspected of being informers, the killings then become unproblematic. Brian Murphy has written that the killings of April 1922 were, “motivated by political and not sectarian considerations. Possibly, military considerations, rather than political, would have been a more fitting way to describe the reason for the IRA response to those who informed”. Most recently, John Regan, an academic historian most noted for his history of the early years of the Free State, The Irish Counter Revolution, has argued that the most plausible explanation for the killings was in the context of IRA fears about British re-occupation of Ireland in the context of the uncertain acceptance of the Treaty settlement. He has suggested that the key event was the IRA capture of three British intelligence officers in Macroom on the day before the shootings. Most likely, under interrogation and possibly torture, the officers told the IRA who their local informants were and the IRA – in particular one ruthless operator named Frank Busteed – proceeded to wipe them out. The killing of IRA officer Michael O’Neill would therefore be either irrelevant to the subsequent actions or merely a spur to them – apparently proof that British were restarting their counter-insurgency campaign. Regan’s thesis is an expansion of the interpretation first proposed by Meehan in A Troubled History. He has criticised Hart’s selective use of sources – his omitting to note that many Protestants in the Dunmanway area were indeed informants to British forces and deliberately downplaying the significance of the capture of the British Intelligence officers the day before. The killings in Dunmanway were, although tragic and dismaying, a small event in the context of the time. They have, in a much different time, assumed greater importance as a result of their capacity to be mobilised in favour of various rival narratives of Irish history. Any assessment of what actually happened inWest Cork in April 1922 is therefore likely to be subjective. However, in the belief that what did happen is more important than the spin subsequently put on it, here is my interpretation. First, it seems likely that some of those killed at Dunmanway were indeed informers to British forces. Others, as is apparently acknowledged locally, were mistakenly killed in the place of relatives who were believed to be informers. The intelligence officers may therefore have sealed the fate of some of their informants while in IRA custody. A random sectarian massacre therefore does not seem to explain what happened. However, the operation seems to have been rather too chaotic to have been a planned IRA attack. The Cork IRA Brigade leadership were all out of the county at the time and when they returned they called in all arms and put guards on Protestant farms to prevent more attacks. So the shootings were (as Hart in fact argued) probably the work of local IRA men or units acting without orders from the formal command structure of the organisation. If Frank Busteed was behind it he was acting on his own initiative. On top of this, there was no concerted loyalist plot. Possibly those who carried out the attacks believed there was, or that they were forestalling one. But the captured British officers seem to have been simply gathering intelligence in a routine manner. Historian Paul McMahon has noted that the British Government authorised £2,000 to re-establish intelligence in southern Ireland, especially in Cork, in early April 1922 (a breach, as it happens, of the Truce) but this does not seem to have been intended as a prelude to a renewed campaign. Those subsequently killed were ‘guilty’ of passing information to a force – the Auxiliary Division – which had already evacuated West Cork under the terms of the Treaty. All of this also occurred during a period of Truce, so by the IRA’s own standards, the killings were illegitimate – a fact that is indicated by the Brigade leadership’s apparent disapproval of the killings. But on the central question – do the killings show that the IRA was engaged in a sectarian or ethnic campaign? – the evidence seems ambiguous. Those killed were targeted primarily, it seems, because they were believed to have passed information to British forces rather than for their religion. On the other hand, no Catholics were killed on those nights. It seems unlikely that whatever intelligence recovered from the British showed no Catholic informers – a pattern most at odds with what we know of the War of Independence. This seems to indicate that sectarianism was indeed a factor in the killings. And how must the situation have looked to West Cork Protestants, whatever their politics? In the aftermath of the shootings over 100 Protestant families fled the area for fear of more killings. But do they show that sectarianism was central to the IRA of the revolutionary years? Only in an indirect way. There was no repeat of the Dunmanway episode and no other incident (in southern Ireland at least) that resembled it. There is evidence of widespread lower level intimidation of Protestants on the basis that they were assumed to be anti-republican, but not of a concerted campaign. In short, yes there was sectarianism, but no, it was not the central feature of the conflict. The Dunmanway killings constitute an atrocity, the killing of defenceless civilians, but not an example of ethnic cleansing. Finally, where does this leave the reputation of Peter Hart? I have argued elsewhere that Hart was an excellent, innovative historian but that he had an unfortunate habit of stretching his evidence right to breaking point to make his arguments. The Dunmanway case is one example of this among many. His thesis, that sectarianism was a dimension of the revolution, deserves consideration but his conclusions need to be approached with caution. Written by: John_Dorney on 1 November, 2011.on 3 May, 2012. 10 Responses to "Peter Hart and the Dunmanway killings controversy"
Interesting article. Could you tell me the reference for the Regan article? Thanks. David, it was a seminar given in TCD on September 28. My mum’s originally from Enniskeane, the village right next to Ballineen, where a couple of these killings took place. I recently sent her a copy of Meehan’s demolition of Hart as the subject would be of interest to her from a lcoal history point of view. Now this is purely anecdotal, but she recalled that as late as the 1940s when she would be cycling home from secondary school in Bandon, every single farm along the road was Protestant-owned. Someone had obviously gone to the bother of establishing that – now, I’ve no idea whether it was actually true or just talk. While she insisted there was never any religious tension between neighbours around the village, and even allowing for the 20 years that had elapsed since the killings, it does seem at least odd. Maybe some kind of underlying agrarian / land-related tensions being given a religious cloak…? I read with interest what John Dorney has to say about the West Cork killings at the end of April 1922, and what he reports me as saying at Trinity College Dublin on 28th September. To be clear, I did not make any claims to know authoritatively what happened during what I and others have called the ‘Bandon Valley massacre’. There is too much evidence missing to come to firm conclusions on many important matters like, for example, the motive for some of the murders. The paper I delivered at Trinity was a deconstruction of the methodology the late Professor Peter Hart employed in his chapter, ‘Taking it out on the Protestants’ appearing in his monograph The IRA and its enemies (Oxford, 1998). My paper was not an attempt to reconstruct the terrible events of late April 1922 – this point I made many times during the seminar but it was lost on some people present. In the course of my paper I did offer two ‘conjectures’ on the likely consequences of three British intelligence officers being captured in April 1922 in Macroom. Nevertheless, John Dorney is quite correct to identify I am critical of the late Peter Hart’s ‘selective use of sources’, but in this practice Peter merely followed an ahistorical methodology, as I understand it to be, employed by other senior Irish historians. The article on the Bandon valley massacre will appear in January 2012 in History: the journal of the Royal Historical Society, and that should remove some of the confusion about my approach to this subject. But the substance of what I have to say is anticipated in another of my articles, ‘Irish public histories as an historiographical problem’ published in Irish Historical Studies vol. 37, no 146 (November, 2010), pp 265-92, which can be accessed on my academia.edu web page. The problems I identify in Peter’s interpretation of the ‘Bandon valley massacre’ have far wider consequences for historical research on twentieth century Ireland. People may be drawn toward looking for the ‘real story’ or the ‘true account’ of what happened in and around Bandon in 1922 or anywhere else for that matter, but the greater issue for scholarly concern are the methodologies employed by professional academic historians. But I can’t agree that this is the most important point here. The reason we study historyis to understand and interpret the past. So what’s really important is what actually happened in West Cork in April 1922 and what its implications are for our understanding of the period. The second interesting thing is why people still care so much in early 21st century Ireland. And a poor third, (for me) is the question of the practice of Irish academic historians. In reality all historians have biases and it’s only by vigourous debate that historical understanding actually advances. Hart for all his flaws opend up areas of debate that no one else had considered. I have been told that people were lined up and shot against the GPO. I have seen the bullet holes myself, but when was this? And does it have a name? Any help would be appreciated! That is absolutely not true Sophie. The GPO in Dublin does have some bullet scars but that is from the fighting there in 1916. No massacre took place there.